The Red-mouthed Stromb is one of the most abundant and widespread of the Indo-Pacific stromb species. 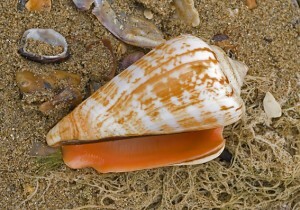 The characteristic red aperture of the shell is however only apparent in mature, thick-shelled specimens (juvenile shells are pink to white internally and thin). In contrast to most stromb species, the Red-mouthed Stromb shell (reaching 80mm) looks deceptively like that of a Cone Snail and hence could be confused with that family of venomous (and carnivorous) gastropods. However all stromb species are herbivores and graze on surface algae, and are therefore harmless to humans (identification tip: all strombs have a notch in the shell-lip, cones lack this). It is still advisable to avoid handling living specimens of any marine snail that looks like a Cone Snail. Like other strombs, the Red-mouthed Stromb is very active and uses its powerful foot and attached claw-like operculum to limp its way along the sea bottom. This species can be very common at certain muddy-sand, seagrass and lagoonal localities and is a prized food in many parts of Melanesia, and hence harvested commercially.